Diurethane dimethacrylate (DUDMA). Long chain-length crosslinking monomer often used in light-cure systems. Cures to form a hard, glassy surface that is low in color. 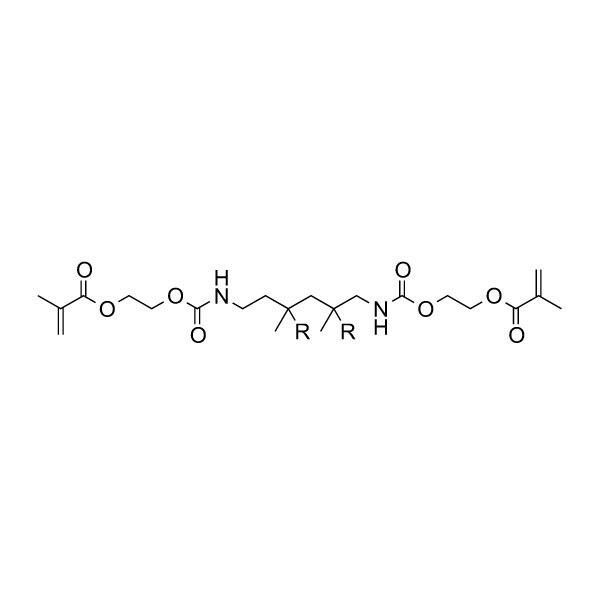 It is also commonly used as the main oligomer in UV and peroxide cured dental, cosmetic, and medical coatings and composites. Synonyms: Urethane Dimethacrylate, UDMA, diurethane dimethacrylate, DUDMA, Bis(2-methacryloxyethyl) N,N’-1,9-nonylene biscarbamate, DiHEMA, trimethylhexyl dicarbamate. Hashimoto, M., Fujita, S., Kaga, M. & Endo, K. Effects of Air on Volatile Compound Contents in Resins. Nano Biomedicine 3, 253–260 (2011).